Holland has more bicycles than residents. And it shows. We have 40,000 kilometers of cycling routes. Discover our country the athletic and relaxed way: by bike. Feel better and see more. You can rent bicycles almost anywhere and they will take you everywhere. At your own pace. Or explore Holland on foot, walking through beautiful landscapes or wandering around in the cities. Many special routes have been mapped out for you, including shopping walks, mudwalks and city walks. Is there an existing building where you want to set-up the installation or do youwant to make a new building? Do you want to blend and bag the fertilisers? Do you want to have two directions from the blender, to bulk and bag? Do you have a drawing of your existing building? Are the raw materials in bulk or bags, or big bags (IBC) stored before blending. Do you want to bag 25-50 kg and/or big bags till 1500 kg. What type of fertiliser do you use? Granular 2-4mm, or cristal, or powder. Do you already have dividing walls in your existing building to separatethe raw materials? What are the dimensions of the existing building? Height, width, length. Do you want to spray liquid in your fertiliser for anti-cacking, color, anti-dust? What capacity do you want in an hour, in a day and how many days in a year do you want to operate? Is there filling equipment available for filling the blender such as a forklift loader,forklift with a bucket? Do you want to work fully automatic (computer system) or regular? How many raw materials do you use? Do you want to work in a charge system or in a continuous system? Do you want to have the machines in stainless steel or mild steel? What type of bags do you use, Polyethylene or Polypropylene? Bags with open mouth or valve bags? To close the open mouth bag, do you want this with a seal machine or tread sewing machine? What capacity do you want to have for the bagging line? What capacity do you want to have for the bulk line? Is there an existing bagging line available and what is the capacity of that line? Are you limited in space in the building (drawing of set-up space idea)? 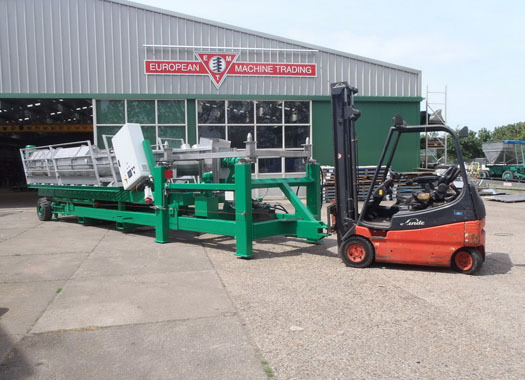 Do you want to have new machines or reconditioned second hand ones? Are the bags of 25-50 kg stored on pallets? Do you use for the big bags open mouth bags or valve bags or both? Strong quality machines due to use of thick and strong steel. Blending is on weight base for exact and guaranteed blending. Less damage of the granular because of less moving parts. Less power supply demand for each kg. fertiliser what have to be mixed. Simple operating method by radiographic remote control. Easy for impregnation liquid in the blend also for impregnation chemicals on the fertiliser. Proven scale system is/or not allowed by Weight and Measures. Shotblasted steel frame with a heavy duty coating on the mild steel parts. All motors are extra closed by IP 56 and have an extra 2 coating anti. corrosive paint. Complete unit is registrated and constructed by European CEE norms. Electrical panel with telemaginique magnetic starters. Electrical panel IP66 closed with panel heating. Delivery of turn key projects. All spare parts on stock at E.M.T. Holland. Set up with E.M.T. technicians. Cables already assembled on the motors with CE connectors. Complete manual requiring the CE norms at the machines. Local inspection before set-up and after set-up machines. Technician will not leave the set-up before machine is in operation. All weldings are welded on 2 sides of the scale hopper and blending machine. Delivery with EUR 1 certificate (less taxes at the customs). Technician who speaks different languages. Operation of blender line in automatic module (remote control) or by hand. E.M.T. can deliver high tonnage machines such as Cyclo-Magnum-Sauer drive blenders with thick steel. Tower and surch blender facility. All motors are normal 50 Herz motors 380 Voltage or on special request 220V. Blending time integrated in electrical panel. Possible to connect the “Optiblend” software program to the dosing. instructions on the blending machines. Standard equipment no special built machines. Possibility for printing analysing certificates with automatic systems. Construction of stainless steel, no fiberglass or mild steel on product moving parts. Hopper width of 2,5 or 3,7 meters to fill the scale. No auger built up with fertiliser and no quickly moving augers. Guaranteed blending quality from the first kg. to the last kg. fertiliser. Unlimited number of fertilisers can be used in a blending. Machines can operate with granular and powder fertilisers. Bagging equipment (50kg or Big Bags). High quality machines with sharp prices. Fertilisers screen in hopper to catch lumps, etc. Clear and big read-out on digital indicator. Possibility to deliver big projects (tower blender), turn-key projects, factory projects, local blender projects. Translation/delivery of the software in own language customer. Stainless steel screw augers delivery. Chemical resistant rollers on the conveyor (plastic). Stainless steel shaft and bearings on the conveyor rollers. All bearings and rollers are painted with chemical resistant paint. Drive and return roller are rubber lagged. Blenders are working on charge system with weigh scale guaranteed 100% accurate blending quality. Standard type V belts on the motors. All weight scale connectors are closed inside the panel (no rust). 100% unloading of the blender drum and hopper?